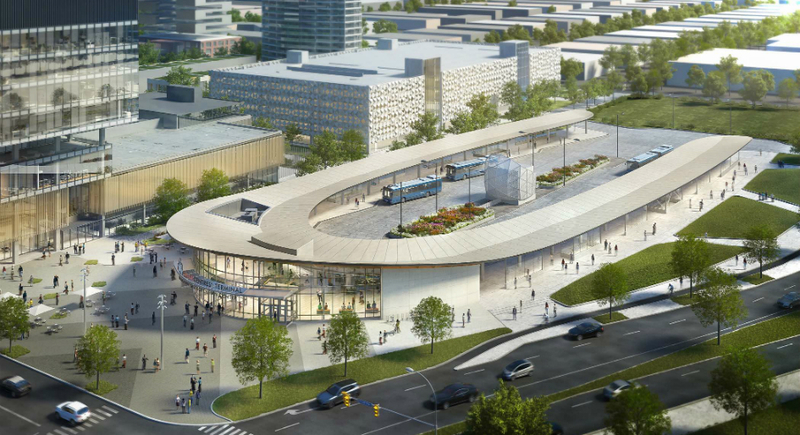 The terminal, designed by Diamond Schmitt Architects, will serve York Region Rapid Transit’s bus network and have a pedestrian connection to the Viva Bus Rapid Transit line and the new terminal station on the Toronto Transit Commission’s extended Spadina subway line. Both the bus terminal and subway station are expected to open at the end of 2017. “The conventional hierarchy of the bus terminal was inverted here, with pedestrians playing the central role in defining circulation and the spaces around the terminal,” said Mike Szabo, principal at Diamond Schmitt Architects, in a press release. The SmartCentres Place Bus Terminal will be located within a pedestrian plaza and will feature a 43,000 square-foot horseshoe-shaped roof over two open platforms and a nearly 10,000 square-foot glazed pavilion. The pavilion will house the main waiting area, staff and service areas, and an underground connection to the adjacent TTC subway station. The terminal will feature nine bus bays with a central island decorated with drought-tolerant landscaping and an ornamental screen to disguise the relief shaft from the subway track below. Platforms will feature glass windscreens and warming shelters to provide protection from the elements while maintaining a sense of openness, according to Szabo. Various levels of government and SmartCentres, the developer of Vaughan Metropolitan Centre, are funding the $32.1 million terminal project.